Abstract:This paper presents pilot studies to assert the feasibility of Photo-Acoustic Tomography combined with PhotoAcoustic Spectroscopy applied to quantitative clinical examination as noninvasive measurement for blood analysts. To estimate the parameters of practical measurement systems in the future, we simulate obtaining the results using a program that was build in Matlab environment. For the assessment, we examined the technique in the case of glucose measurement as an example. 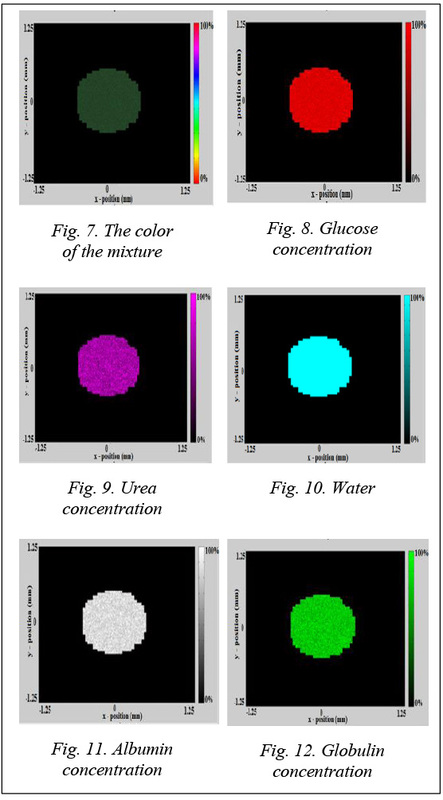 With assumption of an aqueous mixture that includes: Glucose, Urea, Albumin, γ-Globulin evenly dissolved in water, the glucose concentration was extracted from the mixture under excitation light of 300mW and the Fourier analysis of a photoacoustic signal. 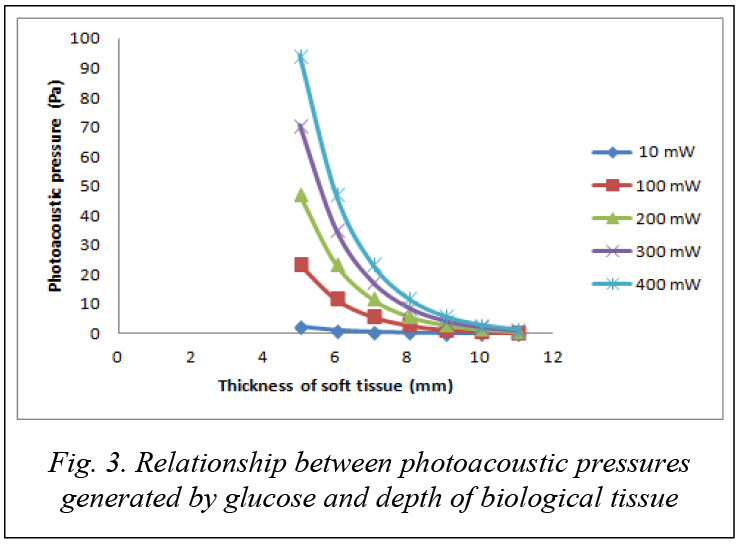 Throughout the simulation, the glucose concentration was determined as 2.8 g/l corresponding to photoacoustic pressure of 2.27 Pa in the condition of 10 mm soft tissue depth and 1mm diameter vessel under the light excitation power. Аннотация:Статья посвящена исследованиям возможности применения фотоакустической томографии и фотоакустической спектроскопии для неинвазивного клинического анализа крови. Для определения параметров, получаемых перспективными системами анализа крови, была разработана программа симуляции в среде Matlab. Оценка работоспособности предлагаемой техники проводилась на примере измерения глюкозы. Предположив, что глюкоза, карбамид, альбумин и γ-глобулин равномерно растворены в воде, была определена концентрация глюкозы в смеси при помощи возбуждающего источника света мощностью 300 мВт и выполнен анализ фотоакустического сигнала по методу Фурье. По результатам симуляции концентрация глюкозы под возбуждающим источником света составила 2,8 г/л при соблюдении следующих условий: фотоакустическое давление – 2.27 Па, высота мягких тканей – 10 мм, диаметр кровеносного сосуда – 1 мм. Nowadays, a number of people afflicted with diabetes mellitus is increasing from 382 million to 592 million as a forecast for a period from 2013 to 2035 . In 2011, 1.4 million people around the world had died due to diabetes mellitus being the one of the 8 top causes of death . Diabetes is a disease causing serious long-term influence. The most significant consequences are cardiovascular, retinal, renal and neuropathic pathologies. Determination glucose concentration in blood is an important method to diagnose the patients who are afflicted by diabetes mellitus. Conventional blood examination methods using drawn blood such as test-strip, electronic glucose meter, interstitial blood fluid and enzyme electrodes are invasive techniques leading to the risk of infection. They are also painful and uncomfortable in several situations. Noninvasive techniques were developed for glucose monitoring as well as other blood analysis. They eliminated the disadvantages of invasive methods. Many optical techniques were employed to overcome the drawback such as polarized light measurement, Raman spectroscopy, near infrared spectroscopy and others. They provide non-ionized and reduce the risk of radiation for medical applications. However, using each method depends on aims of studies such as: optical polarization provides information about structurally anisotropic tissue components: collagen and muscle fiber; optical spectra based on absorption, Raman scattering provides biochemical information because it is related to molecular; optical absorption provides contrast for functional image, etc. Moreover, there were several popular reconstruction image methods that were also applied: Diffuse Optical Tomography (DOT) with excellent contrast and good imaging depth ( 50mm), but poor resolution ( 5mm) ; Ultrasound with excellent resolution ( 0.3mm), good imaging depth ( 60mm), limited by poor contrast ; Photo Acoustic Tomography with excellent contrast, good imaging depth ( 60mm) and excellent resolution (0.01mm) . With the aims of precise determination targeting to glucose concentration in blood, good glucose imaging depth with excellent resolution images is required, a Photo Acoustic Tomography method can be considered. This method is based on photo acoustic effects. When the light passes a biological tissue, an acoustic wave is induced due to elastic thermal caused by interaction of photo streams with the tissues. These ultrasound waves were acquired and then reconstructed with the Time Reversal Algorithm to be an image which the pattern performs in high contrast . The intensity values of the photo acoustic image presented as overlap absorption of the components, leading to imprecise measurement of distribution of each component concentration through the absorption coefficient. The Photo-Acoustic Spectroscopy method can be a solution to extract photo-acoustic spectrum of the components based on their natural frequencies from the measured complex signal. Using the spectrum analysis it is possible to calculate the precise values of the component concentration in the image pattern. This paper presents pilot studies to assert the feasibility of Photo-Acoustic Tomography combined with Photo-Acoustic Spectroscopy applied to quantitative clinical examination as noninvasive measurement for blood analysts. For the assessment, we examined the technique in the case of glucose measurement as an example. To estimate the parameters of the practical measurement systems in the future, we firstly simulate to obtaining the results using a program that was built in Matlab environment. where I0 is the intensity amplitude of the optical pulses. with a, l as the absorption coefficient and the diameter of the blood vessel (optical path length), respectively. With m is mass of blood (Kg); T is a temperature (K); Cv is specific heat capacity (J/KgK). In which, P is pressure (Pa); V is a volume of blood (m3); T is a temperature (K); m is a mass (Kg); m is a molar mass (Kg); R is a constant 8.31 (Pa m3/mol K). Equation 9 presents a relationship between the localized photo-acoustic pressure and the incident light intensity. here P is amplitude of a localized photo-acoustic pressure; w angular natural frequency of the acoustic medium; with v = 1 540 m/s wave velocity; q is an initial angular phase. Figure 2 illustrates a scheme for a photo acoustic Spectroscopy method. To simulate the scheme of the measurement, we used an aqueous mixture pattern in a blood vessel that includes 5 agents: Glucose, Urea, Albumin, -Globulin. Some reports  discuss the simulation of the light propagation in biological tissues proposed under consideration of the energy transfer approximated as diffusion equation. It is called a forward problem. Due to the small acoustic scattering coefficient of the biological tissue , the attenuation of the photoacoustic wave is neglected. In the condition of scattering dominated media, the value of ast in equation 17 corresponding to the effective attenuation coefficient in soft tissue was estimated at 6.88 cm–1 [8, 9]. According to some reports, at the wavelength of 1 600 nm the molar absorptivity of glucose was the most different in comparison with other agents [10, 11]. Therefore, this wavelength was considered to determine precisely the glucose concentration precisely. At 1 600 nm specific absorption (ai) [10, 11], molar mass (mi), molar absorptivity (ei), natural frequencies (fi) of Glucose, Urea, Albumin, g-Globulin and Water were addressed via the references [10, 11] and assumed as shown in table 1. Table 2 describes physical properties of the simulated samples. The scattering of components also can be neglected because they are too small in 1mm thickness of the mixture pattern. u1(t) = u(t – t1), u2(t) = –u(t – t2), duration t = t2 – t1. In this simulation with optical length of 0.1 cm t was calculated as 4´10–7 s .
= pglucose (x, t) + purea (x, t) + + palbumin (x, t) + pg–globulin (x, t) + pwater (x, t). To visualize the concentration distribution, the numerical results of this simulation were assigned using a color. Each color represents each agent and a mixed color expresses a mixture. 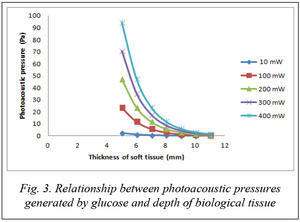 Figure 3 shows the relationship between photoacoustic pressure generated by glucose and the depth of soft tissue under excitation power of laser. As shown in figure 3, with excitation laser power of 300 mW, at the soft tissue depth of 10 mm, the photoacoustic pressure corresponds approximately to 2.27 Pa. This pressure is available for measurement using a typical ultrasonic transducer in sensitivity of 40 nV/Pa. Figure 4 presents square pulses with period time T equal to 10´10–7 s, duration t equal to 4´10–7 s were presented in figure 4. 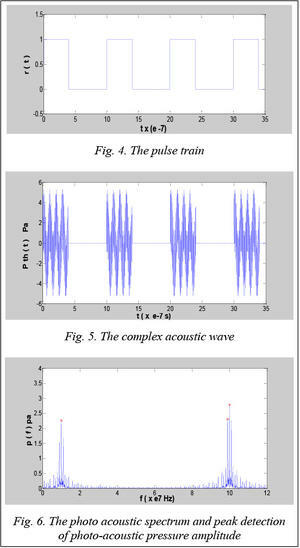 When pulse train excited a mixture, complex acous- tic waves were recorded and expressed using t= (0:35) ´10–7 s as shown in figure 5. 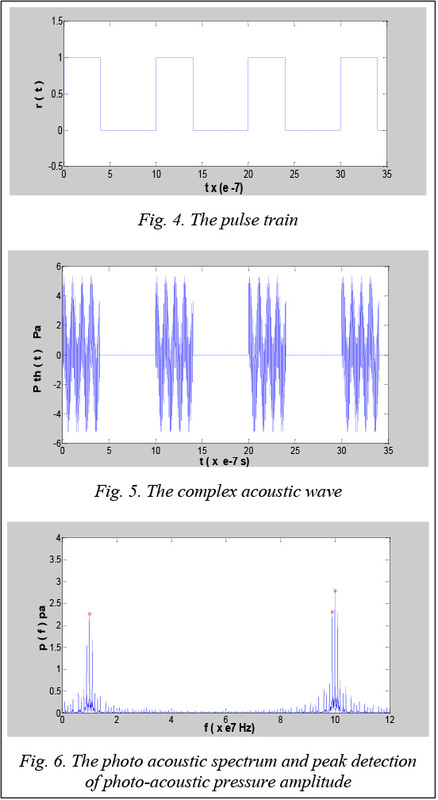 Using Fourier analysis for this complex acoustic wave, we obtained the results the spectrum of photo-acoustic pressure generated from the mixture under excitation of the light pulse train. Then we detected the peak values represented in the photo-acoustic pressure amplitudes of each component using the peak searching algorithm. The results were indicated as shown in figure 6. At frequency of 107 Hz, the photo-acoustic pressure amplitude of Glucose reached to 2.27 Pa. Using this value we calculated glucose concentration based on equation 18 to obtain the concentration value of 0.016 mol/L corresponding to 2.8 g/L. Correspondingly, the values of the agent concentrations were assigned to intensity the components’ color in range of human physiological conditions. In normal human blood concentration ranges of Glucose , Urea , Albumin , g-Globulin  were estimated in table 3. Furthermore, with molar absorptivity of water is 0.005 and specific absorption is 1.34´10-3 cm–1 [10, 11], we also have volumetric distribution of water 0.268 mol/L corresponding to 482.4 mg/dL. A mixture was produced by dissolving from the above agents. Figure 7 shows the color of the mixture. To separate the agents for concentration distribution observation, the color of the mixture is presented as the component’s colors which are used to synthesize the mixture color. It is easy when component agents are extracted from the mixture. Each color represents one agent: Glucose-red, Urea-pink lotus, Albumin-bone, gGlobulin-green, Wa- ter-turquoise. Brightness of colors (dark to light) is based on concentration of component agents as shown in figures 8–12. Concentration ranges of Glucose, Urea: 65–105 mg/dL, 7–18 mg/dL with 0–100 % respectively. Concentration ranges of g-Globulin, Albumin: 500–1 500 mg/dL, 3 200–4 800 mg/dL with 0–100 % respectively. 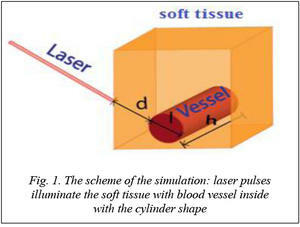 The technique being a combination of Photo Acoustic Tomography and Photo Acoustic Spectroscopy applied to blood analysis was demonstrated using a numerical simulation. Throughout an example of glucose measurement scheme, the precise glucose concentration was extracted from an imitated blood compound including 5 different components. Under the condition of 1 mm vessel diameter and 10 mm thickness of soft tissue with the light excitation of 300 mW generated through the pulse train with its width 0.4 microseconds, the 2D cross-sectional images were reconstructed. The intensities at image point data can be used to indicate the concentration quantitatively by Fourier analysis. With the sensitivity of few pascals for the photo-acoustic pressure level and several hundreds milliwatts for the light excitation, this technique promises the developments concerning to clinical applications of blood analysis practically in the near future. 1. Intern/ Diabetes Foundation: Diabetes Atlas. Available at: http://www.diabetesatlas.org/ (accessed April 4, 2014). 2. Diabetes Fact sheet N°312. WHO. 2013. Available at: http://www.who.int/mediacentre/factsheets/fs312/en/ (accessed March 25, 2014). 3. Wang L.V., Wu H. Biomedical Optics: Principles and Imaging. Wiley-Interscience Publ., Hoboken, NJ, 2007. 4. Balasubramanian V. Chemistry higher secondary – first year. Tamilnadu Textbook Corp., College Road, Chennai, 2004, no. 1, Unit 10. 5. Feynman R., Leighton R.B., Sands M. The Feyman Lectures on Physics. Addison Publ., 1969, no. 1, pp. 47-1–47-8. 6. Li Tan. Digital Signal Processing Fundamentals and Applications. Academic Press, Elsevier, 2008, pp.105–152. 7. Shung K.K., Thieme G.A. Ultrasonic Scattering in Biological Tissues. CRC Press, America, 1993, 512 p.
8. Bashkatov N.A. Optical Properties of the Subcutaneous Adipose Tissue in the Spectral Range 400–2500 nm. Optics and Spectroscopy. 2005, vol. 99, iss. 5, pp. 836–842. 9. Khalil O.S. Spectroscopic and Clinical Aspects of Noninvasive Glucose Measurements. Clinical Chemistry. 1999, vol. 45, iss. 2, pp. 165–177. 10. Amerov K., Chen J., Arnold M.A. Molar Absorptivities of Glucose and Other Biological Molecules in Aqueous Solutions over the First Overtone and Combination Regions of the Near-Infrared Spectrum. Applied Spectroscopy. 2004, no. 58, pp. 1199–1201. 11. Kasemsumran S. Analytica Chimica Acta. 2004, vol. 512, pp. 223–230. 12. Brown Th.E., Eugene H., LeMay H. Chemistry The Central Science. Prentice Hall Publ., Pearson, 2011, 89 p.
13. Zumdahl S., DeCoste D.J. Chemical principles. Brooks/Cole, Davis Drive Belmont, 7th ed., 2011, pp. 865–866. 14. Strege M.A., Lagu A.L. Capillary Electrophoresis of Proteins and Peptides. Human Press, NJ, 2004, 332 p.
15. Rogers K. The components of Life from Nucleic Acids to Carbohydrats. Britanica Educational Publ., NY, 1st ed., 2011, 242 p.
16. Brown L., Holme T. Chemistry for Engineering. Cengage Learning, 2013, 608 p.
17. Shaw A.R., Mantsch H.H. Encyclopedia of Analytical Chemistry. John Wiley & Sons Ltd. Publ., Chichester, 2000, pp. 83–102. 18. Faller A., Schuenke M. The Human Body: An Introduction to Structure and Function. Georg Thieme Verlag Publ., Germany, 2004, 720 p.